Fermented honey, honey wine, mead. It can be quite simple to make. Sanitize the following. 1 gallon glass carboy or food grade PT jug, screw cap lid, funnel, stopper and air lock. Add about 1/3 gallon filtered or spring water to the carboy. Add 3 pounds of honey, through the funnel (if you don't want to risk making a huge mess). Close the carboy and shake, shake, shake until the honey is mixed in with the water and forms a solution. Add more water, so the carboy is about 3/4 full and shake some more, before filling to the gallon mark. Be sure to keep some head space in there. Add 1/2 tsp of yeast energizer and 1/2 tsp of yeast nutrient. If you do not have, emptying a small box of raisins into the carboy I am told will work the same. Add yeast, shake again, cover with the airlock and wait. 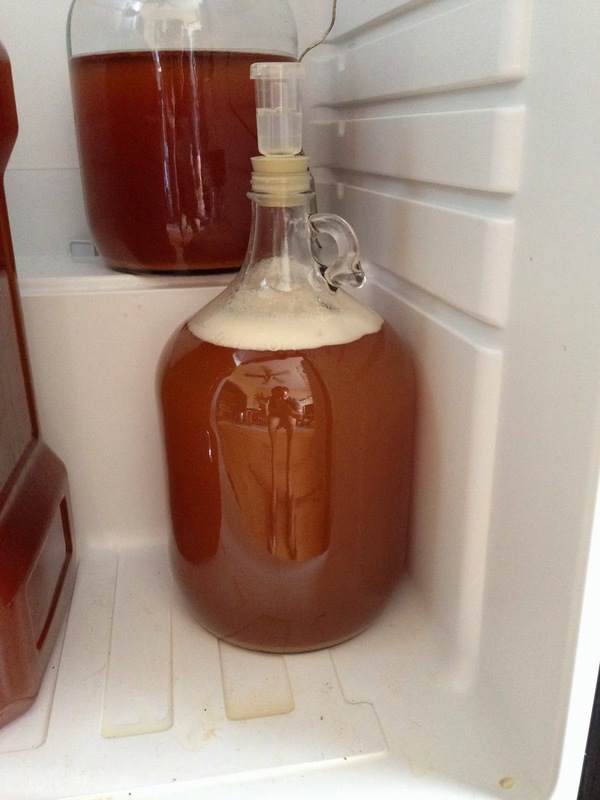 Once the yeast go to work the airlock should pulsate with bobbles for close to a week or more. It will slow steadily over time, and in about 2 weeks you can rack the mead to another sanitized carboy. This will get the mead off the yeast bed which will have formed at the bottom and into a new vessel, and will help in clearing it up visually. I will plan to do the same in another 2 weeks. Test the gravity with a hydrometer when you rack it each time. At the point where the mead reaches the desired gravity and sweetness, you can kill the yeast to stop further activity. You can do this in one of two ways. Pasteurize the mead, by bottling and then raising the temperature to 160 for 20 minutes through a water bath on the stove. Be careful with this approach. Or, by adding some Potassium Metabisulphite to kill the yeast. Let settle for a few weeks, then rack to the bottles. With this batch, I'm controlling the fermentation temperature by leaving it in the fermentation fridge with the setting at 60 degrees. Long term storage will improve mead, but once complete and if it tastes good, it is ready to drink.